Canadian Wildlife Federation: What Should I Do If A Bat Is Roosting In My House? What Should I Do If A Bat Is Roosting In My House? A. 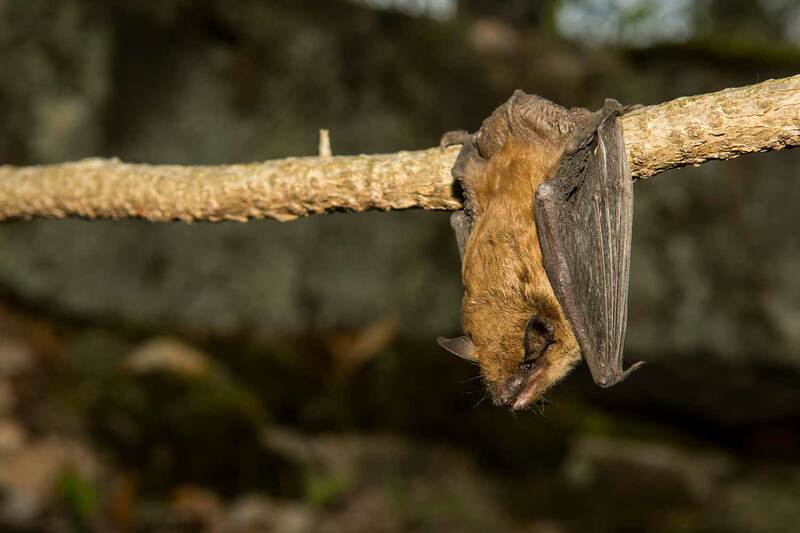 There are many threats facing Canada’s bats such as loss of habitat (including roosting sites) and white-nose syndrome – a fungal disease that has killed millions of bats since it was first discovered in New York in 2006. Bats are amazing animals that are vital to the health of our environment and economy; eating thousands of insects every night! If you think bats are roosting in your house there are a few things to consider before jumping into action! We hope this Seven Step Guide will help you determine what to do. • Bats do not chew on any structures unlike mice for instance. • Bats have very low reproductive rates. In fact, most bats have only one pup a year. • Bats can consume their body weight in insects every night. • Bats are not blind. • Bats do not get stuck in people’s hair. • Bats are not mice. • It is true that bats can carry rabies but so can other species like raccoons, skunks and foxes. You will need to determine if the bats are roosting inside or outside of your house. It is common for bats to find access points under the roof, flashing, rafters, fascia, siding and other areas. If bats are utilizing the outside of your home, perhaps it is best to leave them alone – especially if there is little chance they will come into contact with people. To manage this situation, you could simply plant a shrub or place a potted plant to catch any guano (bat droppings) that falls. Bat guano is a great fertilizer! Plant small trees or tall shrubs near your house. Bats are less likely to fly through these to get to an opening and you’ll be providing natural roosting sites as well. Use orchard tape or tin foil strips to hang on the wall. These will blow in the wind, creating a disturbance. If you have identified areas where bats or bat guano are entering your living space, these gaps can be sealed using caulking, weather stripping, screening or aerosol foam. Interior seals can be done at any time of the year as long as you do not close off their access points to outside. Bat exclusions are often more effective if you provide bats with an alternate roosting site – a bat house. Bats return to the same areas each year and they will be less persistent in gaining access to their excluded roost site if they have access to a bat house. It is recommended to install a bat house at least a couple of months before you perform your exclusion. This gives the bats time to notice the new roosting site. Please visit HelpTheBats.ca for lots of information on bat house designs as well as installation tips. You can even buy a bat house at ShopCWF.ca. If bats are roosting in your attic and you want to evict them, there are a few things to first consider. One of the most important factors is timing. The maternity season for bats is between May 1 and September 1. Within this timeframe, you do not want to do any kind of bat proofing as there could be young pups in the area, still not able to fly. Sealing any entry/exit points will successfully exclude the adults but you will have trapped young bats in your attic that will be left to die. While most bats in Canada either hibernate in caves and abandoned mines or migrate, there are some species, Big Brown Bats, for example, that will use buildings to hibernate in. Therefore, evictions should take place in April (before any pups are born) or after mid-September (when the colony is dispersing but they have not yet begun hibernating). This gives bats time to find an alternate wintering site. If it is the proper time to do an eviction, you will first need to determine their entry and exit points. The easiest way to determine this is to have someone positioned on all sides of your house, watching from dusk until it is completely dark. You are watching for bats to exit your house. Another tip is to look for dark staining. As bats go through their entry/exit points, the oil in their fur rubs off, leaving a visible residue. Once the main access points are known, you should check to see if there are other areas bats could use to enter your home – remember they only need a few millimetres of space to gain access. If it is the proper timing to perform a bat eviction (see Step 4) and you have the entry/exit points identified, then it is time to evict your bats. This is done using one-way doors that are made out of materials that won’t injure or entangle any bats. Common materials are plastic sheeting or a light weight polypropylene netting with a mesh size that is less than one centimetre in diameter. The material should be attached over each entry/exit point, above and on both sides, leaving the bottom edge so that it hangs open below. You want to make sure that the netting hangs approximately 45 to 60 cm below the entry and exit point. This allows the bats to come out through the loose bottom, but don’t worry, they won’t be able to re-gain access. You may also want to caulk any other areas to ensure bats don’t try an alternative entry point. It is important to leave one way doors in place for at least seven nights to ensure all the bats have left. Bats don’t always come out every night and weather – rain, wind and cold/cool temperatures – will also keep bats inside. It is recommended to ensure your one way door is in place for three consecutive days of good weather. It’s also a good idea to watch the entry and exit points the seventh night before any openings are permanently sealed - a final check will help you know that all bats have left. Once you are sure that all the bats have left, it is necessary to properly seal all entry and exit points. Screening, caulking, aerosol foam or weather stripping are all good materials to use. Bats can be very persistent in finding alternate access points once their main access areas are blocked off. Putting up a bat house nearby gives the bats an alternate roosting site.